Prohibition does not stop people from doing something illegal, it merely creates a judicial consequence. Lawless chronicles the true-life rise and fall of three bootlegging brothers in Franklin County, Virginia. Based off the historical novel, The Wettest County in the World, the film explores the ins and outs of corruption and gang war in the deep South during America’s Prohibition Era. Jack Bondurant (Shia LaBeouf) witnesses Floyd Banner (Gary Oldman), a kingpin bootlegger, massacre two men in the middle of town. He explains to his own brothers, Forrest (Tom Hardy) and Howard (Jason Clarke), Franklin County’s infamous moonshine producers, what he had seen. Despite loyalty residents have with the Bondurant’s booze, another kingpin, Charlie Rakes (Guy Pearce) and his minions, have aligned themselves with the corrupted police to threaten the Bondurant business. Jack is quite the fan of bootleggers as he pastes clippings of news articles all over his bedroom wall. Dillinger, Bonnie and Clyde, Pretty Boy Floyd; these criminals during this time period exemplified something rather complex in American history. They liberated what was so vastly beloved and robbed those who greedily protected their wealth. Despite their criminal inclinations, they were admired by American citizens and became stars in their own right. Jack yearns to work with his brother and become as admired and beloved. Keeping up with appearances and maintaining the lifestyle is essential to retaining power. The film’s kingpins Floyd and Charlie, although now no longer in cahoots, are well dressed and groomed. Along with competing in business, they compete in attire. Once Jack becomes a factor and begins to earn large amounts of money, he too purchases finer clothes, sportier cars, and a dress for his love interest, Bertha (Mia Wasikowska). This contrasts with Forrest, who maintains his humble appearance and relaxed nature, primarily perched on a rocking chair outside his bar. Forrest is also a rather interesting character. Labeled as invincible by county residents, his immortality is tested several times in the film, and his ability walk away from seemingly fatal moments is—as Jack, the narrator proclaims—dictated by dumb luck alone. It is an element to the film and story that helps it standout as many of the elements of this story are nothing new. We know that Prohibition helped generate the egregious growth of organized crime in America, created an industry of hobbyist automotive performance enthusiasts, and exposed a vast conspiracy of corruption in law enforcement. Yet the Prohibition Era also has an aura of irony; as America went through a very large period of growth, and despite the Amendment that was designed to keep the country dry, the 1920s was a large party. Stocks were headed ever higher and higher, credit was liquid, and the consumable liquid of choice was still alcohol, of which, was readily available if you knew how to speak easy. This historical context is explored today in HBO’s original series Boardwalk Empire, but Lawless places the ironic struggle in the deep south. What prevents the film from being just another iteration of the same ole’ story, the themes can be seen as an allegory of the prohibition of cannabis today, especially since a large portion of the American population has admitted to using the substance despite its illegal status. 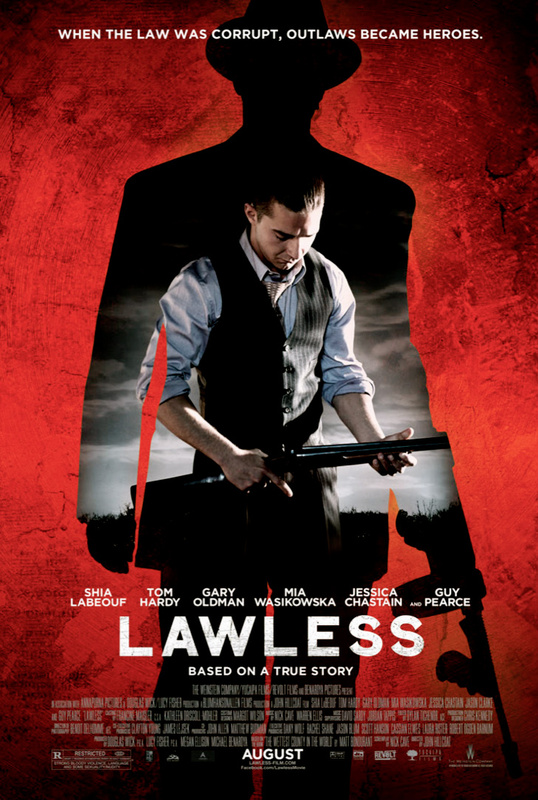 The screenplay for Lawless was written by Nick Cave, the Australian musician, author, actor, and scriptwriter, who also composed the score, based Lawless off on the historical novel by Matt Bondurant, a descendent of the main characters. The film was directed by John Hillcoat, whose other directorial efforts, The Proposition (2005) and The Road (2009), both have themes of lawlessness in locations that are secluded from and under threat of modernity. Even with an expressive story, Lawless has an ensemble cast that helps it move steadily. LaBeouf’s easily provides his best performance after calling it in from home for over a decade. Oldman is superlative as usual, while Hardy and Pearce battle for the machismo that bootlegging organized crime requires. Jessica Chastain and Mia Wasikowska provide the purity and beauty as a contrast to the intricate tale of bootlegging. Chris McGarry, whose performance in Chronicle was promising, has proven himself here as a character actor worthy of being cast alongside the talents mentioned above. 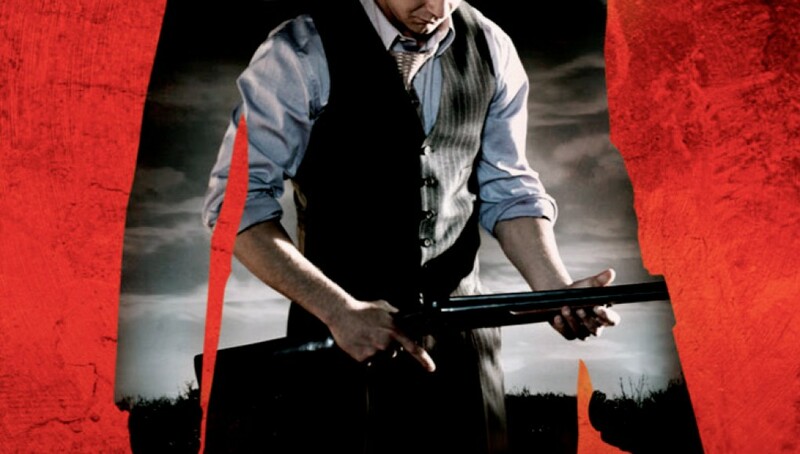 Lawless effectively creates a story not unlike many of films about Prohibition. Scarface, the 1930s or 1980s versions, frame the protagonists as tragic victims whose immigration status prevented them from assimilating into American lifestyle and culture. The Bondurant brothers, particularly Forrest, are seen as monoliths in the county, providing the vice that the residents demand. Director Hillcoat presents us with a film that moves efficiently, does not stumble over old tropes, and also provides some nifty scenes.